The NLx is a partnership between the National Association of State Workforce Agencies (NASWA) and DirectEmployers Association. The NLx contains on average, 2.3 million jobs every day. 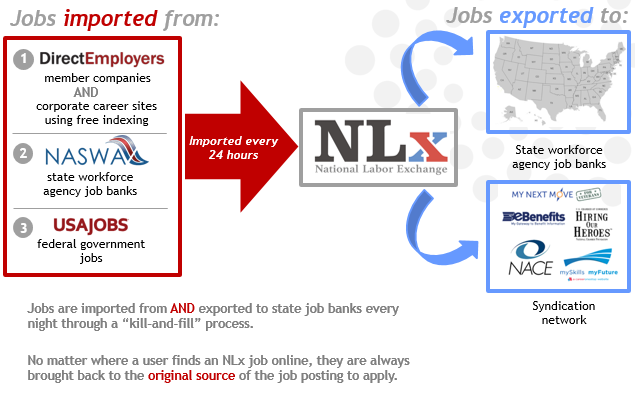 Jobs listed on the NLx come from one of three sources: directly from corporate websites, state job banks, or usajobs.gov (federal jobs). Content is refreshed on a daily basis so job seekers can be assured the jobs they are looking at are currently available. There is no cost for any employer or job seeker to use the NLx. The NLx also provides job content to a number of other websites, such as www.careeronestop.org, www.veterans.gov, www.apprentice.gov and www.studentveteransofamerica.jobs. For more information, visit www.usnlx.com or www.veterans.usnlx.com. • All employers are validated by government or NLx staff to ensure jobs are legitimate. • The NLX (www.usnlx.com) is optimized for all mobile devices (e.g. smartphones, tablets, etc.). • All jobs listed in the NLx are coded with Occupational Information Network (O*Net) data.